All liveries must be of scaled down 1:1 appearance, however colour combinations and liveries from other modern (year 2000 to present) race cars may be used. 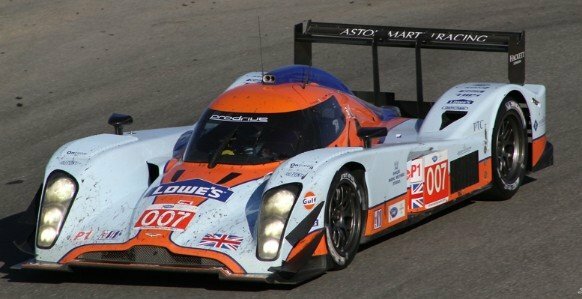 The Oreca Racing 'FLM' Formula Le Mans car is not classified as LMP1 or LMP2 in either the LMS or ALMS and therefore is not permitted to run in the OAPR. However, the Oreca 03 as raced in 2014 in LMP2 is allowed to run. 2.04 Minimum ground clearance at the start of the race: 1.00 mm (Competitors are encouraged to start at 1.4mm when using motorbox type chassis). 2.05 Minimum ground clearance during and after the race: 0.40 mm (Event organizers may enforce a higher minimum during racing - provided competitors are made aware of this prior to official practice). 2.06 Minimum front rim outer diameter: Ø21.00 mm. 2.12 Minimum rear rim outer diameter: Ø21.00mm. 2.13 Minimum rear wheel starting diameter at the start of the race: Ø 26.50 mm. 2.14 Maximum rear wheel diameter at any time: Ø 27.50 mm. 2.15 Rear wheel width and contact area always 13.00 mm – minimal rounding of edges are allowed. 2.16 Maximum width of main chassis plate: 78mm (On motorbox type chassis the front edges of the main chassis plate should be rounded off to prevent digging into track surfaces during excessive compression). 3.01 The race motor may only be a long can (FK-180). Any 25000 or 30000 rpm variant may be used, but event organisers MUST specify the exact motor before an event. Motors may not be opened and must have positive identification on the can itself, motors with wrappers must have these wrappers removed so that the can identification is visible. 3.02 The spur gear is fixed at 44T M50 pitch. 3.03 The M50 pinion gear is completely open and left to the driver to decide - event organisers may NOT specify this at all. NB! - The chassis is completely open provided it adheres to the specifications in these regulations. You may use any commercially available chassis, mix parts from various chassis, modify any part of the chassis as you see fit and even build your own chassis. 4.01 Only one part of the chassis that is allowed to enter the track slot, and this part may not have a longer contact area than 27 mm. 4.02 Differentials are not allowed. 4.03 Magnets are only present in the motor, and are not allowed anywhere else on/in the chassis. 4.04 Chassis must have vertical movement, some of which must be sprung for suspension purposes. 4.05 All chassis assembly must be by means of bolts and nuts, no self-threading screws, solder or glue may be used. 4.06 The motor cannot be affixed to the chassis with solder. 5.11 The front wheels must make contact with the track or techblock over the full 6 mm, or more. 5.12 The use of cambered front wheels does not void in any way the rule regarding the minimum diameter, or the rule regarding the contact surface with the track or the tech block. 5.13 Front wheel diameter for cambered front wheels will be measured at the largest present diameter, which has to be respecting rule 2.07. 5.2.1 Rear wheels are always Scale Auto ProComp 3 or Plafit rubber - both being 'Black Magic'. If handout tyres are used, the event organiser must specify the brand and the size when announcing the event. Tyre dressing of any kind is not allowed during the official practice, qualifying or during the race. The race tyres may only be cleaned using tape or Shellite supplied by the OAPR/race organization. 5.3.1 None of the wheels may be visible when viewing the assembled car from above. Spur will be measured over the complete rims left and right, including wheel inserts. 6.01 Only vacuum formed 15 thou clear bodies are allowed. Provided these bodies have been homologated by the OAPR organisers. 6.21 Body must be manufactured and/or assembled from one or more of the following materials: PVC, PET, PETG or Lexan. 6.22 The exterior of the body has to accurately represent the 1/1 car. This is to the discretion of the scrutineers to judge(s). No widened, stretched, flattened or smoothed silhouette style bodies will be allowed. 6.23 The same materials are allowed for the interior, windows etc., rear wing, diffuser and small add-on parts. Lexan is allowed for a rear vertical aero wing e.g. 2011 Peugeot 908, etc. All wing mounts must be the correct shape and can be made from rubber or lexan. 6.24 The body must cover all chassis and axle parts, so that no chassis part or axle part is visible when the car is viewed from above. This also includes the guide or any part thereof. Painted head/helmet combination in a hard plastic material. Light inserts. (These are the plastic moldings that fit behind the outer light lenses and are normally mounted inside the body). 7. LIGHTS. (Optional during the day, but compulsory during night races). 7.01 If functioning lights are installed then these lights must be installed (even during day racing) in their original 1/1 positions on the car. 7.02 Front lights: minimum two lights in total, one left, one right, yellow or white color, bright beam. 7.03 Rear lights: minimum two lights in total, one left, one right, red color, diffuse light. 7.04 Cars must always be fitted with light inserts even if no actual lights are fitted. 8.01 No working on cars during lane changes or track calls. All work on cars must be done during racing. 8.02 Any part bigger than 20mm (wheel insert size and bigger) that come off the car, must be put back on the car in it's original position. Tape may be used to do this. 8.03 If working lights are installed and any corner of the car loses light during racing, then the lights must be fixed during racing. THESE REGULATIONS ARE LOCKED FOR 2019. THE ONLY CHANGES FROM NOW ON WILL BE WHEN NEWLY RELEASED BODIES HAVE BEEN HOMOLOGATED FOR INCLUSION IN THESE REGULATIONS OR WHEN ANY SPECIFIC COMMERCIAL PART IS REPLACED BY THE MANUFACTURER WITHOUT NOTICE. THESE AMENDMENTS (if required) WILL ONLY TAKE PLACE AT THE END OF MARCH, JUNE AND SEPTEMBER 2019. THESE TYPES OF CHANGES WILL ALWAYS BE SUBJECT TO AVAILABILITY TO EVERYONE RACING IN AUSTRALIA - AVAILABILITY ON THE WWW WILL BE CONSIDERED ACCEPTABLE.Please keep an eye on the discussion section of this forum for any developments that may impact on possible regulation changes.